An abundance of summer fruits makes for a great alternative to what’s inside my snack cabinet. Instead of salt water taffy, caramel corn and ice cream, I’ve been reaching for strawberries, cherries or peaches. Fruits like this have been such a huge part of my summer diet that I’m now at the point where I’m dying to figure out a way to jazz them up. Believe me, I’m not bored with them, and I realize come December I’ll be going through summer-fruit-withdrawal; I’m simply trying to indulge my creative bug and get crafty in the kitchen. If you peruse the internet and page through any cookbooks you have on hand, you’ll find creative ways to use your fruit: grilled or broiled, sautéed with butter and brown sugar, or reduced in a pan with alcohol and sugar. The possibilities are endless! 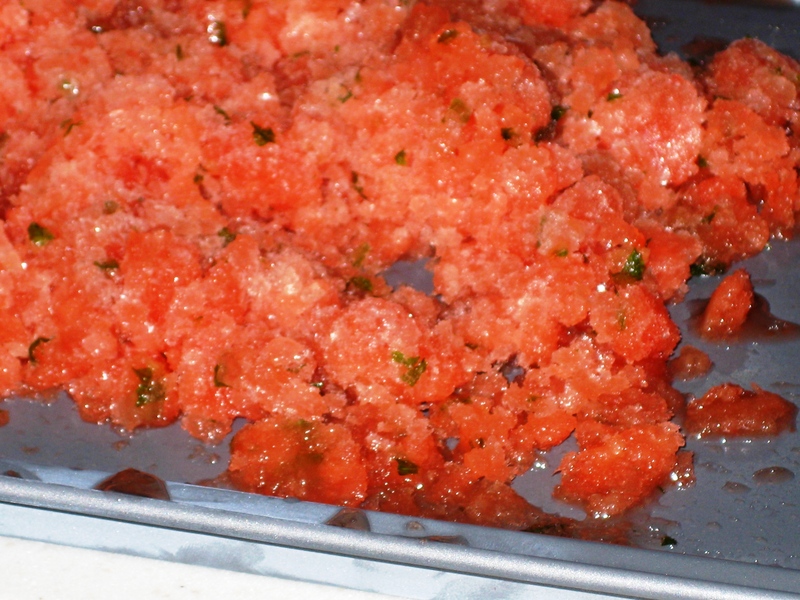 Still, I was looking for a more seasonal approach and narrowed it down to frozen recipes using leftover watermelon. Though a search using key terms produced many margaritas and alcoholic beverages, I found a gem of a recipe on Food Network’s site. Granita is an Italian, icy dessert, made with an equation of a liquid plus sugar and possibly the addition of another flavoring. The freezing and “raking” processes, combined with the amount of sugar, give a granita the crystallized texture it is known for. Combine all ingredients in a food processor. Puree until smooth. Pour into a shallow, wide pan and freeze for 1 hour. Rake mixture with fork and freeze for another hour. Rake and freeze for one more hour. Rake and serve in cups. 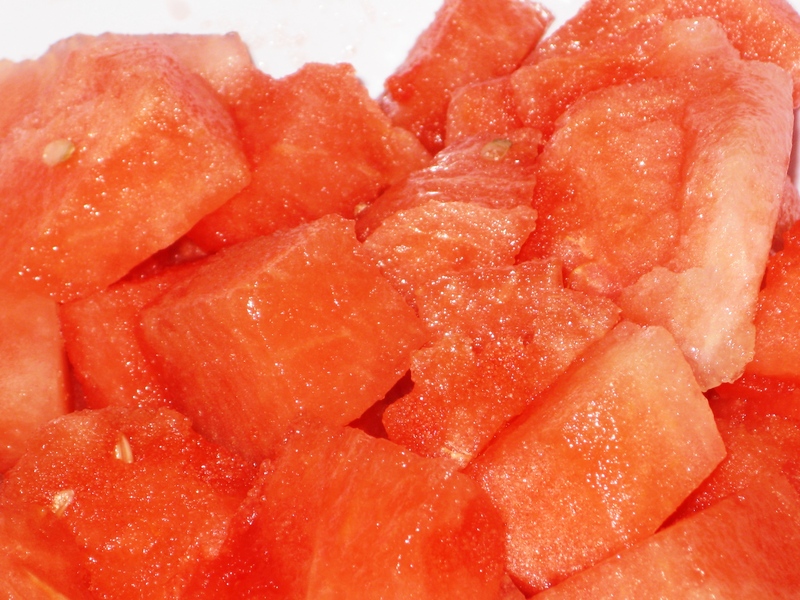 I decided against fully pureeing the watermelon, as I prefer chunks of fresh fruit here and there in frozen desserts. When I added the sugar to the food processor bowl, a pang of guilt swept over me. Why on earth, when the watermelon was so ripe, would I need to use that much sugar? The end result proved to me that the sugar is an integral part of the process in creating the granita’s texture. Additionally, the dessert did not taste too sugary, and the natural of sweetness of the watermelon was maintained. Chopping the mint leaves then adding them to the food processor to pulse into the mixture allows them to fully permeate throughout the granita mixture. With each bite, the herb offers a refreshing complement to the watermelon, and (though it was a last minute modification on my part) the two seem to be a perfect pairing. 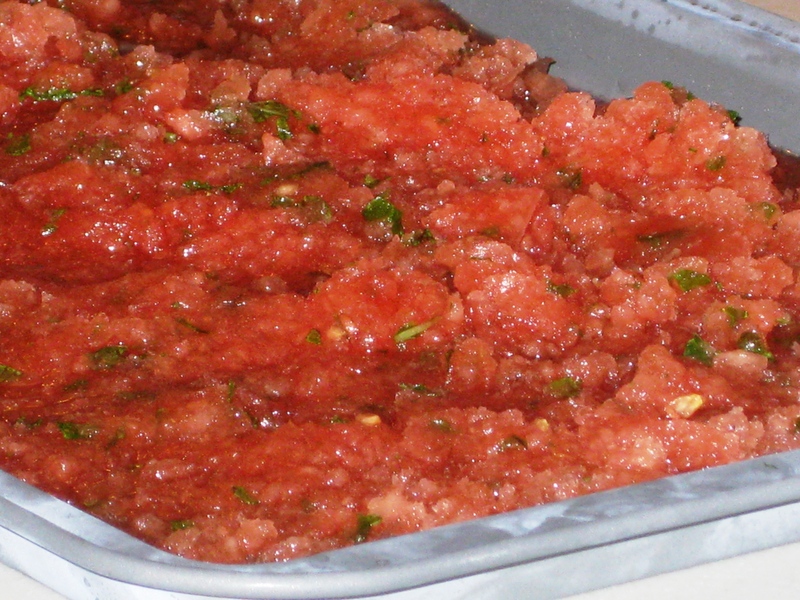 Leftover granita should stay fairly well in an air-tight container in the freezer. I’ve found that removing it and letting it sit on the counter for a bit first allows you to mix it up, helping to bring some of the original texture back to life. However, the leftovers are not as granulated as its original state.